“In the twilight, the wounds of the liberated city of Kobani appear almost soft. After the attacks by the Islamic state, the tattered buildings breathe a melancholic quietness that reminds even more emphatically of the destruction.” Photographer Sonja Hamad is describing the reality of Kobani in Syria, moments after war ceases. Her words are so strong that they graphically shape the heartbreak of witnessing ISIS raze entire your city to the ground. But Kobani is slowly gaining new life, having been reclaimed by an all-female political party fighting for their freedom. Hamad has spent over two years photographing Kurdistan's YPJ – an all-female political party made up of over 10,000 women aged 15-45 who are battling against ISIS to reclaim Kurdistan. Physically, it’s a reclamation of Kurdish land currently buried under the weight of its statelessness quartered between Turkey, Syria, Iran and Iraq. Socially, it’s a feminist pursuit of liberty, as these women not only use their autonomy to consume traditionally masculine roles in war, but as they reclaim themselves from one of history’s most violent oppressors. A collection of their portraits can be found in Hamad's photo series » Jin - Jiyan - Azadi « Women, Life, Freedom, which urges us to look beyond sensationalised photos of these women in Western media in order to meet the real women behind the guns. Here, Hamad tells us the story behind one portrait from » Jin - Jiyan - Azadi « Women, Life, Freedom. “Zilan is 19 years old. I met her at the highest point of Sinjar Mountains: a place that plays a very important role in the recent history of the fight in Iraqi Kurdistan. It’s where IS kidnapped hundreds of Kurdish Yazidi and sold them as slaves on markets, raped, and even beheaded them. This was the place where women had to be protected the most – so that’s why I chose to visit the female freedom fighters here. The highest point of Sinjar is a pilgrimage site. It’s a very safe spot, almost like a fortress. “Zilan seems like a normal 19-year-old girl, but at the same time, she has a particular strength to fight against the IS and to protect her own people. Her confidence and conviction for the Kurdish freedom movement at this young age fascinated me. She is wearing the typical guerilla clothing, a wide short and a uniform jacket, all in olive-green, and a “Schutik” – a lengthy weapon-belt that is bound fancily around her hips. “Besides the fact that I was surrounded by war, and moments of fear were present, the moments with these women, who encountered me in a very open way, dominate my memories of this time. The fact that we shared the same language and the same cultural identity lead to a very close relationship – it made me almost forget that I was amidst a war. “I travelled alone to northern Iraq without any journalists or people from the media. This allowed me to establish a deep and honest connection with the people there. When I reached the fighters (you need to receive permission to spend time with the women), it didn’t take long before they trusted me. I became like a sister to them. 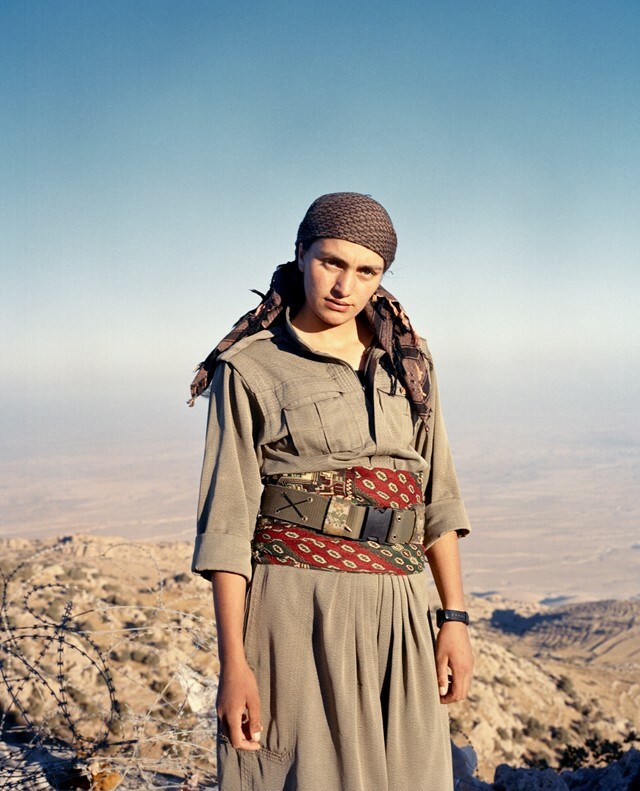 “The story of the Kurdish female fighters is very personal; it’s a piece of home for me. My cultural background made it easier for me to access the fighters and hear their stories – our shared background allowed me to get really close to them. “When I first saw pictures of them in the media I immediately thought, this is not the right way to portray them, waving their guns around and screaming. It was very important for me to let the women tell their stories and what they are really fighting for. I was keen to avoid sensationalist images of the fighters. I’ve found that Western media outlets are fascinated by the Kurdish female fighters who risk their lives in the fight against ISIS, and yet, the hundreds of headlines and photographs of these women are largely homogenous: they depict them as little more than glamorous pistol divas, precursors of ‘eastern’ feminism. I wanted to show the women behind the guns. I really hope that through my work the Kurdish female movement and those women, in particular, will be recognised more by people all over the world and that this movement can really receive change in terms of women´s rights worldwide.